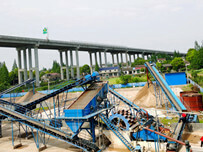 The manufactured sands produced from our equipment is commonly used in the manufacture of concrete which is particularly useful in areas where there is shortage of natural sand or when you need to buy in natural sand for use in your concrete production. • Efficient removal of the minus 63 micron / 200 mesh material – typically 15%-20% of the feed. 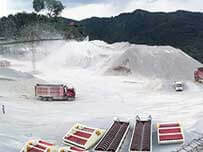 • Crusher dust is typically very lean in the 63 micron to 600 micron / 200 mesh to 30 mesh range so it is essential that none of this material is lost during processing. 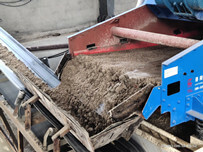 • Where there is clay present in the crusher dust we have a number of attrition options available to allow for effective removal of this clay from your final washed sand prodcuct (AtroFeed, RotoMax logwasher and AggMax portable logwasher). Due to the level of variation in crusher dust from one situation to another each plant is custom built to deal with the specifics of your material and your desired final product specifications. This involves extensive material analysis in the first instance to determine the volume of commercially viable product that can recovered from your crusher dust. Then we set about the design and delivery of a crusher dust washing plant which will maximize production of manufactured sands and minimize waste from your rock crushing operations. 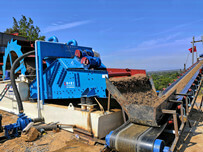 Next：How to install vibrating feeder?